A still from a personal video message from Pope Francis to Philadelphia. 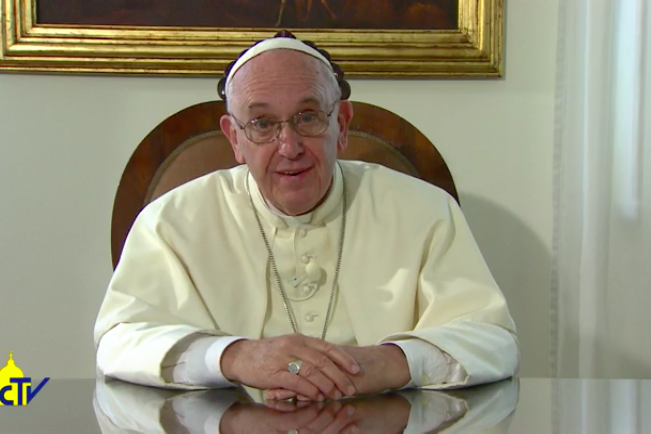 Pope Francis sent a video message to the people of Philadelphia on Sunday. "I look forward to greeting the Pilgrims and the people of Philadelphia when I come for the World Meeting for Families," Francis said in a 30-second video released by the World Meeting of Families. "I will be there because you will be there. See you in Philadelphia!" he said. Archbishop Charles J. Chaput said in a statement, "His personal call to each of us and his desire to be with all during his visit to Philadelphia is deeply moving," Philly.com reported. Pope Francis began his trip to Cuba and the United States on Saturday when he landed in Havana. He will be in Philadelphia this coming Saturday and Sunday.